First off, I don’t know or care how many people read this thing (yawn, another newsletter). And I know, it’s part 2 (double yawn, now actually sleepy). So long as there’s just ONE person to read it and appreciate it as something resembling the truth. In a world of fake news, real news, fake news posing as real news and real news posing as the real news…remember before fake news existed (wait, did it ever exist? )…who the hell knows what to believe! Argh! Meddling! I’m here to tell you about something simple, and maybe something you can believe in. A whiskey we’ve got for you — Tennessee High Malt…specifically Batch 001 — why it’s special and why we love it. Let’s start with the name. 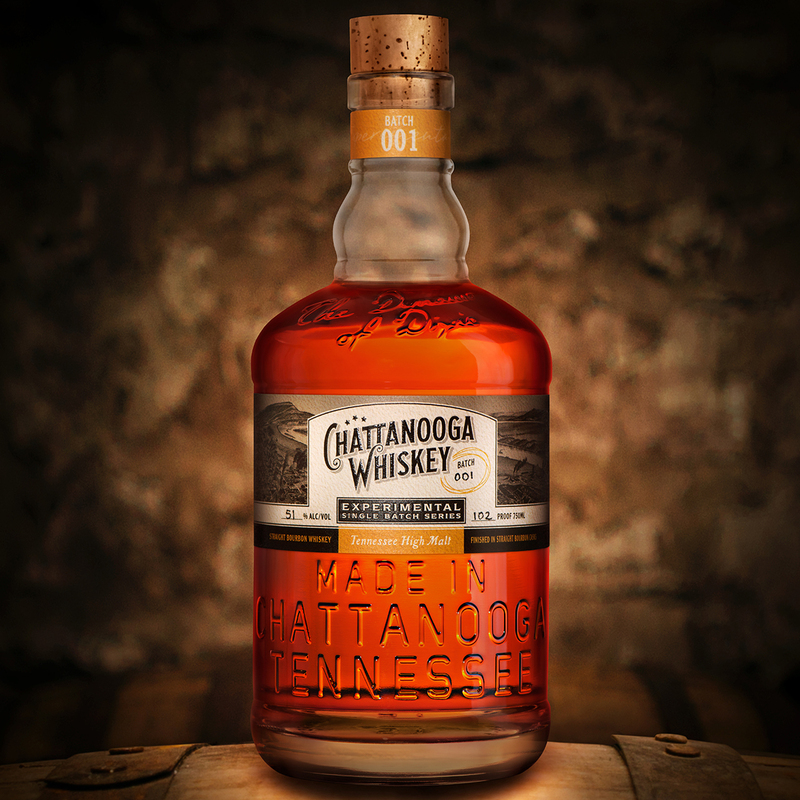 It’s made in Tennessee (102-year sigh of relief), and it uses a high amount of malted grain. Name is simple, straight forward, yes? Good. Hopefully it’s fun to say too. Say it with me, “Tennessee”, “High”, “Malt”. Even if you didn’t say it out loud, I just made you read it again. Marketing, ha. What’s so special about malt? You might know that it’s a craft behind a craft. You might know that malt was once a seed intending to grow, but maltsters stole its enzymes and sugar, put it in an oven, and made something resembling seed cookies. Everyone loves cookies! It’s way more complex and you might already know way more, but if you don’t, go read about it. If you don’t know how to do that, get the same person to read it to you who’s reading to you right now. If not, I’ll loan you my guy. He’s good. Funny voices. He does dictation too. Consistency is important. First is rye malt. Rye Malt is basically rye, malted (flip-flop thing there). No super-high temperatures, no fancy steeps or air rests, pretty much rye made more flavorful. So imagine that…classic rye-spice with a little more depth and intensity. Next is caramel rye malt. This one is rye malt that’s been roasted to caramelize some of the sugars released from the malting process. The compounds created make cinnamon, raisin and bread-crust type flavors in the malt. If you cut the crust off of your bread, you are a child…or you’re missing out on life. So imagine that…cinnamon raisin cookies. Yes, cookies…again. Last is honey malt. But please don’t let its name make you think that honey is in the malt or the whiskey. It’s not (Writer’s note: If we make honey whiskey, I’m out of here) (Editor’s note: This is how we can make him leave). Honey malt is germinated and kilned with recirculated air in a very specific way to coax out flavors reminiscent of the sweet, floral notes of honey. If you don’t like a hint of dark honey flavor, I don’t know what to do for you. If it’s the whole thing about “bee vomit”, I kind of understand…but it’s so punk rock! These 3 malts make up approximately 25% of the mash bill. If you think that sounds like a lot, it is. A lot of bourbon and whiskey (including 1816) uses <10% malt, which means it’s a minor flavor contributor, and, they don’t often use anything like what we mentioned above. Traditional bourbon (see: 1816) is mostly about the expression of the barrel—the spirit taking on a more minor role. Our spirit uses more malt to sculpt and define our very own unique flavor profile—something not possible with raw grains. High malt is where we break the mold, even the mold we use in our award-winning 1816 series. 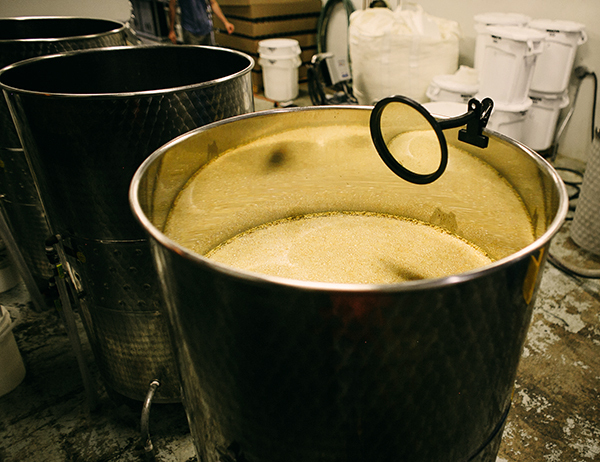 …the sweet canvas for our malt to speak—the grain that makes this whiskey a bourbon. 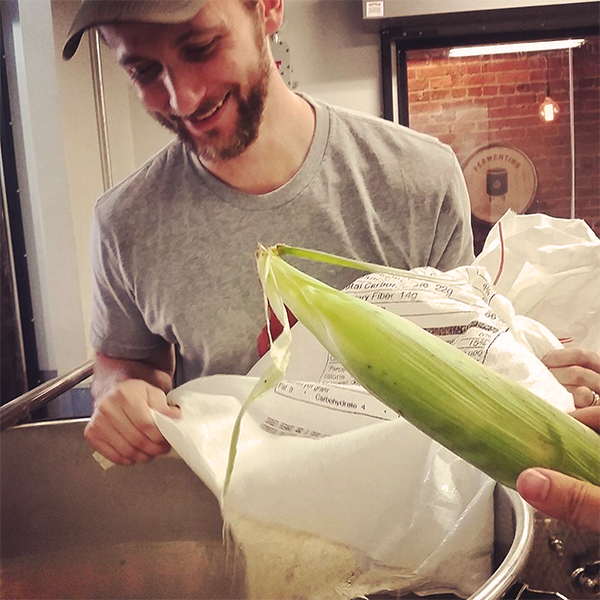 For all of our experimental batches we use non-GMO, stone ground, yellow corn from Riverview Farms in Ranger, GA. Stone ground corn has some additional complexity given that the mill does not get as hot as in a traditional roller mill. Less heat means we retain more volatile compounds in the corn and theoretically create a more flavorful whiskey. Brad Swancy and his twin brother, Wes, run the farm and stone mill. Yes, we can tell them apart. Brad and Wes work their asses off and are great musicians to boot! Hot and fast fermentation character can sometimes yield higher overall fermentation “character”, but at the expense of complexity and a desired “volume” of compounds. We’ve found longer, cooler fermentations mean greater ester suppression (malt flavor can shine), but more ester complexity—which we find desirable in our whiskey. At the end of the “active” fermentation, we get what’s called transesterification from the acids created from the native bacteria in the air in our distillery. These complex reactions are based in the functions of acetyl-coa, esterases and the eukaryotic vs. prokaryotic nature of yeast vs. bacteria. All to say, I HAVE NO CLUE WHAT IS GOING ON IN THERE RIGHT NOW! But I believe in climate change, and I believe in this too, cuz I read it in a real book, and the proof is in the pudding…and we love our pudding, er, whiskey. We distilled this whiskey in our 100-gallon Vendome pot still two times; reaching proofs around 140-145. These are pretty standard numbers for bourbon—matching a clean profile with complexity of the grain. In the end, this is where we found we like the flavor. Much higher and we lose some of that malt and fermentation character, much lower and things seem distracting and a little rough. This batch uses 12 x 25 gallon toasted and #4 char Kelvin Cooperage barrels. Two and a half years ago there was something of a barrel shortage, so we thought it would be appropriate to do our very first experiment with a smaller barrel size. This means that we get a higher ratio of wood surface:whiskey, and thus a slightly higher amount of wood character to match our malt-forward bourbon. We considered 10 and 15 gallon barrels, but their wood character would have probably overwhelmed even the strongest of malt characteristics in our bourbon. Toasting the barrel prior to charring gives us more flavor complexity as well, thanks to the complex pyrolysis and Maillard reactions that occur when heating the barrel over a longer period of time. These wide-ranging aromatic compounds are then extracted by the whiskey and provide even more flavor complexity – smoke, spice, vanilla, butterscotch…yum. We entered the barrels at a proof of 115-120. This is a classic bourbon “zone” and pulls out compounds that are classic to the profile. Old rule of thumb is that low strength typically pulls more color and wood sugar, higher proof pulls more wood flavors. But practically speaking, experience will tell us where we like it. For now, we’re on the 115 train…all…night…long. 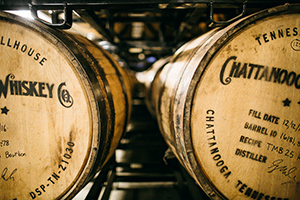 We aged each barrel in this batch for at least 2 years in our heated underground cellar on Market St. The cellar receives all of the heat from our distillation and cooling processes, such that in the summertime, it gets well over 100 degrees. This higher than average temperature is excellent for flavor reactions in barrels. We still get the temperature swings that help the whiskey push/pull into/out of of the pores, they just exist in a higher zone. So, this might be the first heated dunnage cellar whiskey ever? If so, right on! A little over two years later we tasted some of the barrels and realized the whiskey was “ready”. Which is just to say that the balance and character was pretty much where we wanted it. Having said that, the whiskey’s slightly higher wood character competed with some of the fruity fermentation character & nuanced malt profile. So what’s a distiller to do? If you’ve ever worked in a kitchen, you know how this works: work with what you’ve got. For at least 60 days, we gave the whiskey a chance to “breathe” inside these emptied, 53 gallon barrels. Being almost 9 years old, they had little left of their oak components to share with the spirit, and instead used mostly oxygen to promote more transesterification reactions. This softened out the edges of the profile with more fruit and confection notes, thereby pushing aside some of the wood character. All this whilst giving a tip of the cap to our favorite law-changing friend, 1816. Win-win…win! We knew we wanted it right around 100 proof, because it opens the aroma nicely and it’s a nice sipping proof for people who like whiskey. 100 proof is also where we see fewer reactions related to haze stability – meaning hazy whiskey on the shelf – which some people find weird looking (odd truth). We then lightly filter (no chill-filter) to take away some dust and make it look pretty without stripping out our lovely esters and flavor. 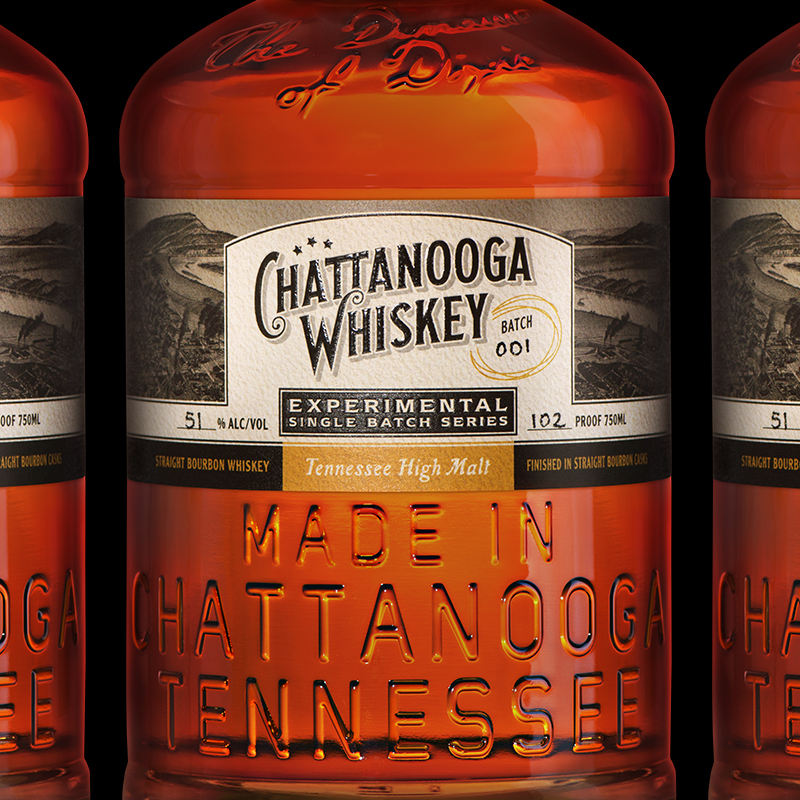 Instead of 100, we thought it would be cool to acknowledge the historic significance of this event from the long prohibition of 102 years without aged whiskey in Chattanooga. Voilà. No overwrought blind triangle tests, no pretentious “perfect proof” discussions. Let the whiskey speak for itself. Add a cube of ice or a little water, if you like. Expect aromas and flavors of maple syrup, molasses, cinnamon, fruit cake and dark honey. It evolves as you drink it, so do me a favor and take it slow. What’s Next with the Experimental Series? Well, let’s start with what you WON’T see. Most experimental whiskies are made with a control in mind (usually the distillery’s flagship), and test one variable to showcase the difference (ex: toasted barrel heads vs charred barrel heads). You can put the results in a GC/MS, plot it in a chart, talk about it with your closest geek friends and maybe even in a technical paper. Our experimental whiskey does not have that goal. Not only do we currently lack the sophisticated equipment, but other distilleries already do this pretty well…and we’re not that kind of distilling crew. By design, our experiments change multiple variables at once, use on-hand ingredients for the sake of the challenge and even evolve as they’re being made. If it sounds more like an art project than an experiment, cool! We aren’t trying to be pretentious, we’re just trying to find beauty in our work. If you think THAT’S pretentious, well…maybe you should get a hobby. Tasting whiskey, perhaps?Perfect. A lot of truth and a little levity for a very important event for a small distillery in Chattanooga, TN. 228 cases of this fine spirit have been bottled and it is our first of many experiments in the world of Tennessee High Malt and BEYOND. This is our whiskey and we really love it. We really hope you love the whiskey too, but at the end of the day—just like this note—I’m OK with just one person caring about it. And selfishly, that person’s me. Thus, I will channel the great Belgian brewer, Armand DeBelder, of Brouwerij Drie Fonteinen when I say, If you do not like our whiskey, “then I say it is a pity for you”.